The scene is Silverstone, just four days after David Coulthard won the Brazilian Grand Prix. Rain is teeming down to the point where the Scot has abandoned traction control testing on the near-flooded track. Instead, he is sitting clutching a cup of coffee, pondering on his success at Interlagos which stopped Michael Schumacher's winning streak which extended back to last year's Italian Grand Prix. 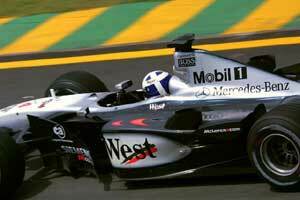 Coulthard looks back on Interlagos on a particularly satisfying win, reflecting on the fact that he ran from the start on compromise chassis settings which only paid off when the rain started to fall. "Compromise chassis settings meant that the car was not quite a sharp, a little softer, than usual," he said. "But I managed to keep in touch and it all paid off. But the speed of Montoya's Williams-BMW was certainly impressive. They will be a factor for the rest of the season, no question about it." David has always been a realist. Six years into his career with the McLaren-Mercedes team, the Scot understands better than most how the F1 percentage game works. Put simply, the fourth, fifth and sixth places a driver posts during the course of the season can be every bit as crucial in determining the strength of his World Championship challenge as the outright race wins. Coulthard also knows that there is a premium on scoring points in the early part of the season, when rivals are perhaps less prepared. For three years, Ferrari's title challenge was thwarted by mechanical unreliability in the opening races of the season. In 2000, things were different. The Ferrari was quick, reliable and competitive out of the box. Coulthard failed to score points in the first two races of the season, completing the San Marino Grand Prix - third round of the series - with third place. That gave him a total of four points after three races, some 26 points behind Michael Schumacher. This year he has 20 points, leaving him six points behind the German driver. At the end of the season, Coulthard finished third in the title chase, some 35 points behind Michael. It doesn't take a Rhodes scholar to deduce that, if he continues to progress as he has done, the McLaren-Mercedes driver should finish even closer to Schumacher at the end of the 2001 season. All things being equal, of course; a caveat which applies with equal validity to Schumacher's efforts as it does to Coulthard's. The key factor which may play into his hands could be the intervention of the newly revitalized Williams-BMWs. For the past three seasons Ferrari and McLaren-Mercedes have had the F1 turf pretty well to themselves, carving up the race wins between them. But now it is different. Williams proved at Interlagos that it just might be the King Maker this season, even if neither of its drivers managed to make it to the Championship. As Michael Schumacher rightly acknowledged, Williams have made the 2001 title chase a three-way affair. But Williams has just three points after the first three races - despite Montoya's heroic efforts at Interlagos - and their most likely role is that of "spoiler," taking points off both the Ferrari and McLaren drivers if they should drop off the front-running pace for any reason. In the past, the one thing which has also failed to go the genial Coulthard's way is luck. "Joss," as the Chinese like to call it. Some of it may be self-generated, some just a question of David that crucial lucky break. This year it just might be different. With a bit of help from the Williams-BMWs of Juan Montoya and Ralf Schumacher. Just maybe.